When data loss occurs, your entire business is at risk. Critical systems stop working. Employees are idled. Operations grind to a halt. And with each passing minute, the costs balloon higher and higher. 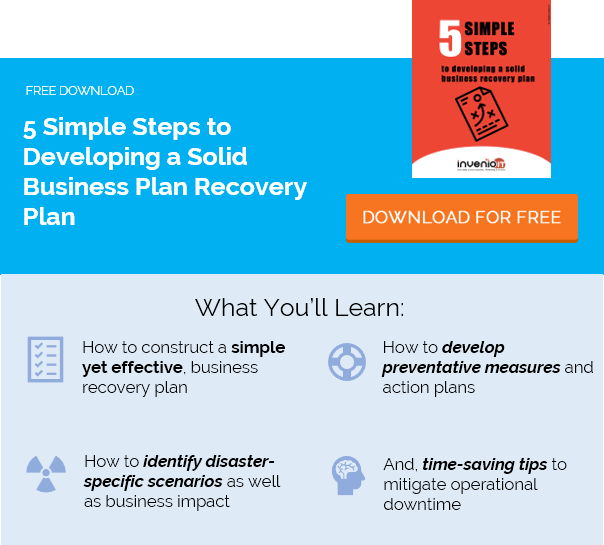 If your business isn’t able to recover quickly enough, it may never recover at all. Obviously, deploying a data backup system is essential. But what kind? Which provides the most protection without costing a fortune? For many businesses today, the answer is DRaaS. In this post, we answer 8 important questions about DRaaS to define what makes it different from conventional backup systems and whether it may be a good fit for your organization. DRaaS is short for Disaster Recovery as a Service. Unlike conventional disaster-recovery systems, which reside on the premises of a business, DRaaS relies on cloud computing to power data backup and recovery. If you use any SaaS platforms (Software as a Service), then you’re already familiar with the basic idea of using the cloud to power applications and store data offsite. DRaaS is a little bit like that, except more comprehensive, providing protection for your entire infrastructure. It protects your desktops, servers, business-critical data and operating systems, making them instantly recoverable in the cloud, through a web-based interface, from basically anywhere. DRaaS has several benefits (as we uncover below), but the two big ones are: 1) Off-site data replication for greater assurance against on-site disasters, and 2) Affordability. For many businesses, DRaaS makes more financial sense, because it eliminates the need for sprawling in-house backup infrastructure and private clouds. 2) Backups in the cloud? Is that risky? DRaaS isn’t the same as simply making copies of files and storing them in the cloud. Services like Google Drive and DropBox are not DRaaS. When we talk about DRaaS, we’re talking about robust business continuity and disaster recovery solutions (BC/DR) like the Datto SIRIS. What’s the difference? For starters, Datto uses a “hybrid backup” approach that backs up your data in two locations: 1) on an on-premise backup appliance and 2) in the Datto Cloud. So you’re never putting all your eggs in one basket, so to speak. Should you be conscious of where and how your sensitive data is being stored in the cloud? Absolutely. Again, this is what separates a serious DRaaS system from an ordinary cloud-based file storage service. In the case of the Datto SIRIS, your data is fully encrypted both in transit and as it resides in the cloud. Additionally, Datto mirrors your backups to secondary data centers in geographically diverse regions for added protection in case one data center becomes unavailable (i.e. after a widespread natural disaster). This is in addition to a host of additional security features and protocols that keep your data safe. In most data-loss incidents, it’s not the mere loss of data that costs you. It’s the downtime. Depending on the size of your business, each hour of downtime can cost anywhere from $10,000 to $5 million. This is why a fast recovery is so important. The Datto SIRIS stores your backups as fully bootable virtual machines. And again, those backups are stored in the cloud, in addition to the on-site device. So in the event of a major ransomware attack or server malfunction, you can access your backup virtually in a matter of seconds, from anywhere. To be clear, you’re not merely recovering individual files (though you can do that too). You’re virtualizing entire servers and workstations, so that critical personnel can continue using the applications that keep your business running. 4) What if we need a total restore of all our data? In the event of total data loss, you can still virtualize your data instantly in the cloud or via the on-site appliance. But you obviously won’t want to use virtualization forever, so the question becomes: how do you get all your data back? With Datto, you have a few additional options for retrieving all your data. For one, with enough bandwidth, the data can simply be transferred back to your Datto device. For larger restores that would take too much time to send over the Internet, Datto will copy all your data from its datacenter to a portable storage drive and ship it to you (or your managed-service provider). But even before that drive arrives, you may be able to use Datto’s other restore options, like a bare metal restore or its “diskless restore” option, which is an alternate method of virtualization. Rather than virtualizing a recovery point from the on-site Datto appliance, diskless restore lets you virtualize from any target hardware that’s capable of booting from a USB stick. 5) What about granular file recovery? Yep, you can still do that too. Above, we gave examples of scenarios in which you may need to restore all your data. But let’s face it – everyday data loss is usually a lot smaller. Somebody deletes an important file. A folder goes missing. You know the drill. It happens all the time. With DRaaS – particularly Datto’s BC/DR systems – you can still rapidly restore files and folders on a granular level, from the cloud or from the on-site BDR appliance. Additionally, “Datto Insights” lets you quickly locate file changes between two recovery points, which is really useful for finding missing files that nobody remembers deleting. 6) Who manages the DRaaS? In the case of Datto, the management of your DRaaS would be handled by you and/or your managed-service provider (MSP). A key benefit of DRaaS is that it can free up resources from your IT department, so that your teams can focus on other critical tasks. Additionally, for smaller businesses, DRaaS can provide the same level of disaster recovery protection as enjoyed by much larger companies – without requiring you to hire IT staff or make big infrastructure investments. You maintain control of your BC/DR system and can recover files, virtualize a backup and adjust your backup configurations as needed. But when you need additional support, you can also rely on your MSP. After a disaster, for example, if you don’t have any in-house IT staff, your MSP can handle the recovery process for you. Similarly, larger businesses may also prefer to rely on the MSP for DRaaS and business continuity management, so that in-house teams can devote more of their time elsewhere. Remember, DRaaS is enabled in part by the cloud, which in turn enables faster response from your MSP. It often eliminates the need for on-site visits, which only lengthen the recovery time. With DRaaS, your MSP can often manage the recovery remotely – no waiting. 7) How often are backups? Maintaining an aggressive recovery point objective (RPO) is important, no matter what kind of backup system you deploy. If disaster strikes and your last backup is a day old, you’re going to lose a ton of data. By leveraging DRaaS, you do not need to make any sacrifices in how frequently you perform backups. In fact, with the right system, you may even be able to increase that backup frequency vs. what you have now. With the Datto SIRIS, for example, backups can be performed as often as every five minutes. It all has to do with Datto’s Inverse Chain Technology, which stores incremental data changes in fully constructed backups that have no dependency on previous backups (unlike conventional incremental backups). As backups are completed on the device, they are also mirrored to the cloud, so that you can recover from either source, usually just moments after backups are completed. 8) What about threats like ransomware? Ransomware has become a top concern for businesses over the last couple years. No company is completely immune, and we’ve seen companies of all sizes become paralyzed by infections. A good backup system is a crucial line of defense against a ransomware attack. When an infection occurs, you can simply roll back to a clean recovery point to get your data back and remove the threat. But what about DRaaS? Does using DRaaS provide the same level of protection as conventional on-site-only systems? Absolutely—if not even more protection. For starters, remember that DRaaS lets you replicate your data to the cloud. So in the event of an especially nasty attack that locks up your on-site infrastructure, you can still virtualize in the cloud to get up and running again, pronto. But also, the Datto SIRIS comes with built-in ransomware protection to reduce the risks of a widespread infection across your network. The device actually monitors for signs of an infection (i.e. sudden high-volume file changes) and alerts the administrator. Admins can quickly identify where and when the infection occurred and choose the appropriate recovery point (or even use Datto’s Rapid Rollback feature to quickly revert a production machine’s filesystem to the state it was in at the time of the selected recovery point). Learn more about DRaaS and find out how it’s right for your organization. Request a free demo of hybrid-cloud BC/DR solutions from Datto, or contact our business continuity experts at Invenio IT. Call (646) 395-1170 or email [email protected].